Suddenly my computer started running very slow. 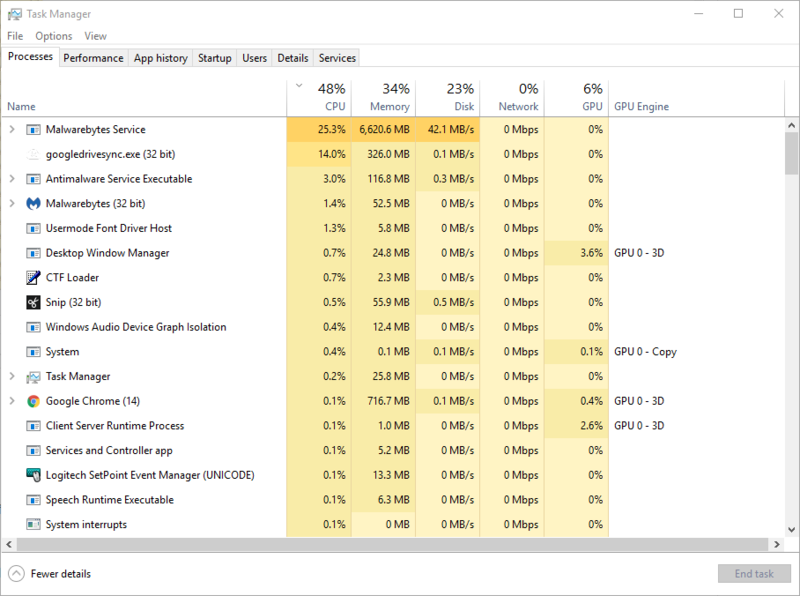 I closed chrome first because it's more commonly my culprit, but the computer remained sluggish- it took a few minutes to launch Task Manager. I was surprised to see Malwarebytes service listed at 5,300-6,000mb, and I couldn't even open the program to see if it was scanning. I rebooted and launched ready manager and watched MB quickly work it's way up to the same 5gb range. I successfully ran a scan to see if something was going on- no results, though I noticed it had disabled my web protection. Computer is still running slow, MB is still running at about 5,600mb, and it doesn't seem to want to turn back on Web protection. It kind of just hangs on "Starting..." and eventually gives up. I'm new to the software, I used to use Avast. Any advice? Yeah holy stuff just noticed my computer slowing down with malwarebytes is eating up 10 gb of ram. Same here it was up to 10000, before i shut down the service. Then i restarted Malwarebytes and its at 8000Mb at the moment....and going up! Same thing for me, I had to uninstall MB. I right-clicked the icon besides the clock and selected "quit mwb". This helped, but now I'm left with Windows Defender. Web protection is turning off as well. Web protection turning off and +13go memory usage.. Quitting the program didn't do anything for me but slowed it down for a moment and I can't stop the service I guess I'll have to uninstall. It doesn't stop either I suppose it will just continue again till I run out of memory. Yes and web protection is off as well after the restart. Same here, it killed my computer and happened again after a reset. I closed it when it got into 21GB out of my 32GB memory. 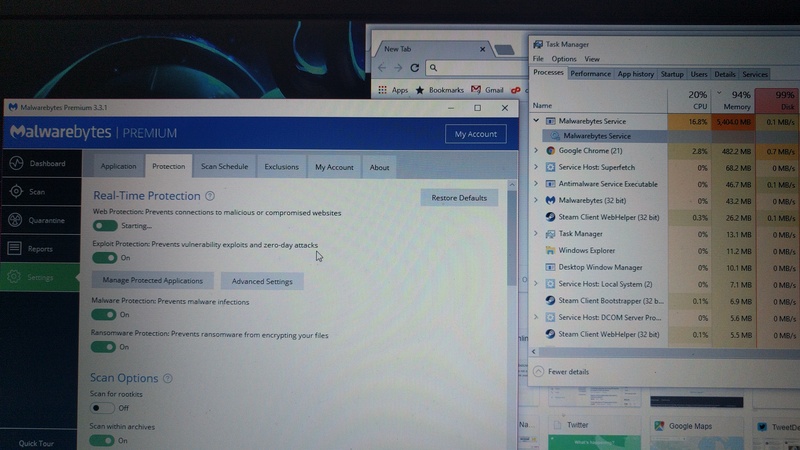 I have this too, it is bad - I have to terminate the Malwarebytes service and leave it down. It eventually eats up all available memory and kills my performance if left alone. Same here, await the solution. Just jumping on the bandwagon here. Same problem as described above: Realtime Protection gets turned off and won't turn back on, then it starts eating memory until everything stops and I have to do a hard re-boot. Uninstalled the program and it's fine now, but I don't like paying for something I can't use. I wonder what the hell's going on? This is insane. Mine got up to 12GB usage before my system his 100% and started closing applications. Thanks Malwarebytes for losing me some photoshop work. What the hell is happening? Has MB gotten infected? I noticed as other said too that it would auto turn off my web protection. Is that to save memory and CPU usage or is something fishy going on with the guys who are supposed to keep things from going fishy? When I closed it from task manager it did come back on, but then I closed it from the program itself instead of task manager and it seem to stay closed for now.